A few names will sound familiar to Final Fantasy veterans. Among them: Cid, Princess Sara, Gilgamesh, and finally Biggs and Wedge. 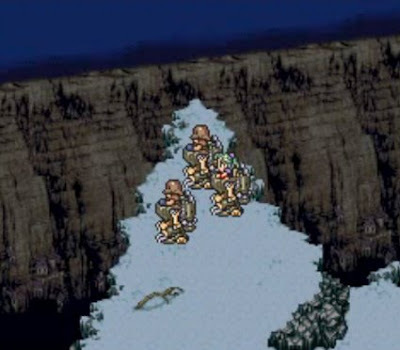 The last two, however, are minor characters who debuted in Final Fantasy VI, with the former’s name being mistranslated as “Vicks,” which probably deterred a few players from identifying the pair as Star Wars references. In reality, they’re meant to call back to Biggs Darklighter and Wedge Antilles, Luke Skywalker’s wingmen in A New Hope. In re-releases of Final Fantasy VI, the name is corrected to “Biggs.” I am not a fan, though this fact has nothing to do with my distaste for the Star Wars movies. No, I enjoy the way translation from English into Japanese and back again can completely obfuscate the intended reference, giving the new word a whole life of its own in the way the term “Merton” — which also debuted in Final Fantasy VI — remained mysterious until we outside of Japan realized it was mangled representation of the word “meltdown.” In the meantime, “Merton” it was. The fact that Biggs and Wedge’s roles in any Final Fantasy is to die ignominiously offers me no solace. Vicks forever.